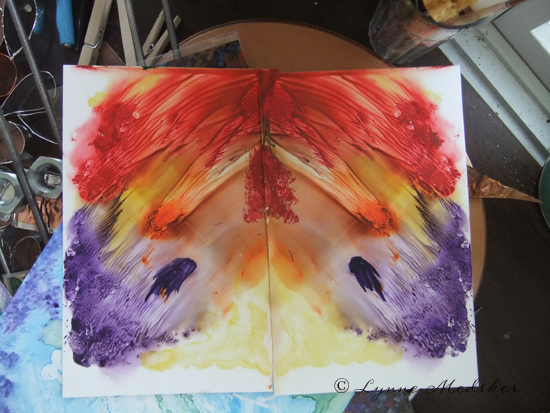 These were fun and reminded me of a more colorful/interesting version of the ink blot images we used to make as kids – we could all see different things in them! What do you see in the image above? I’m curious if it’s the same as what I do. 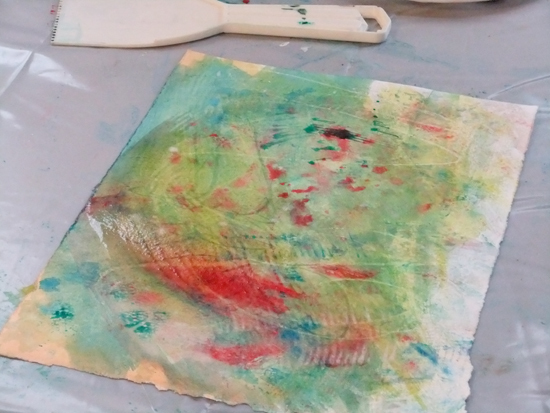 One thing we attempted wasn’t very successful, but that’s what happens in a class titled “play” – we were experimenting with media, not aiming for masterpieces. 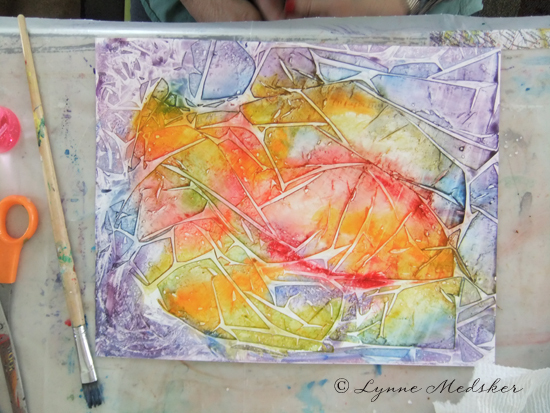 🙂 The technique was to take the paper outside and use stencils, lace, etc. 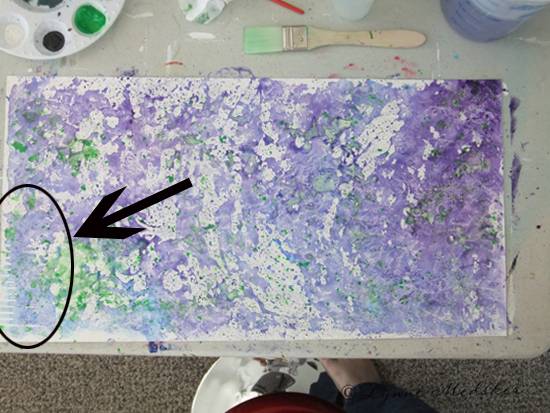 and spray a clear acrylic paint over them to leave a pattern that would be blocked out in white when we added the watercolor. It probably didn’t help that it was a windy day and we had spray paint issues! 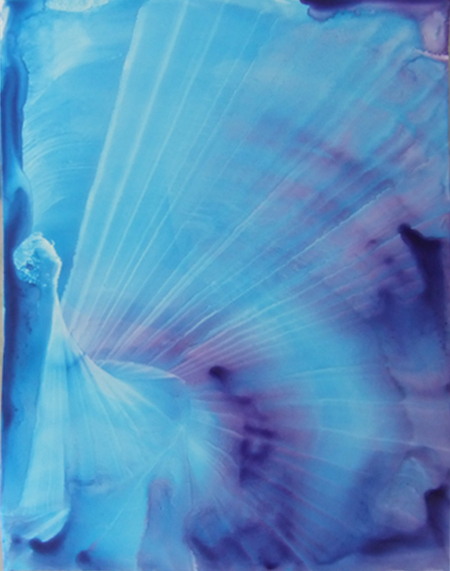 You can see in this image that there was a bit of success but even that eventually disappeared as more watercolor was added. 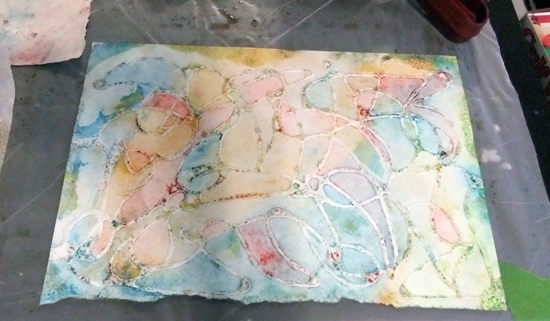 Washing on a layer of watercolors and then laying plastic wrap on top made for some really interesting abstract patterns. 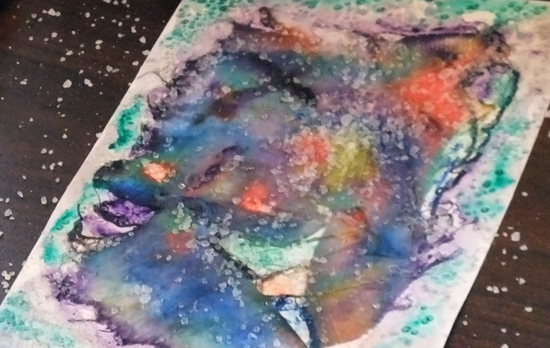 Well, if you were patient enough to let it dry before you took the plastic off! 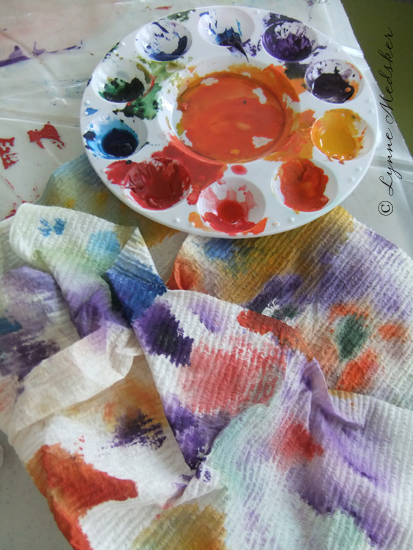 We had so much fun moving the paint around on the paper that even our paper towels ended up looking colorful! The last technique we tried involved tissue paper layers on painted Yupo. 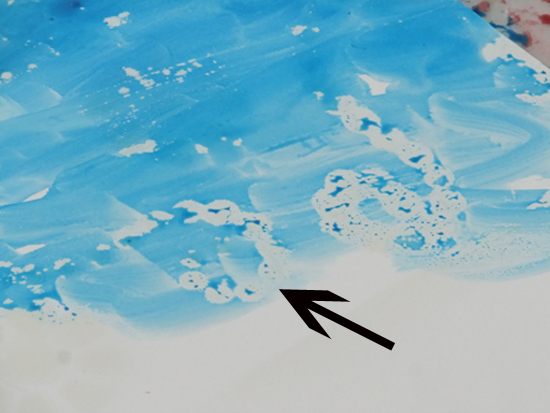 Some were removed, others were kept, some moved to new placement and were adhered to the paper with clear acrylic gel. In a recent post I mentioned that I’ve been playing with film (yes, the stuff we used to put in our cameras before memory cards!) and some cool little cameras. I finally got the film developed and scanned and thought it would be fun to share with you a few of the images. 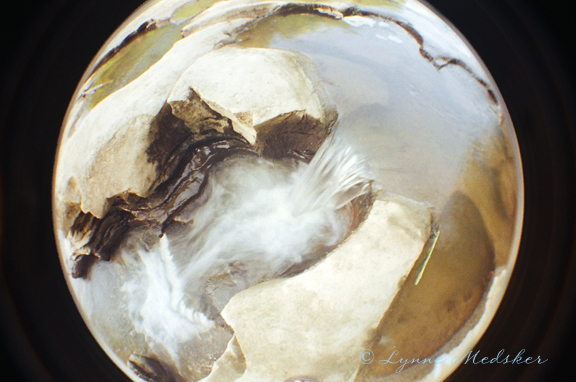 The images for today are from one of the cameras I bought to play with, it’s the Lomo Fisheye #2, and I must say it’s lots of fun! 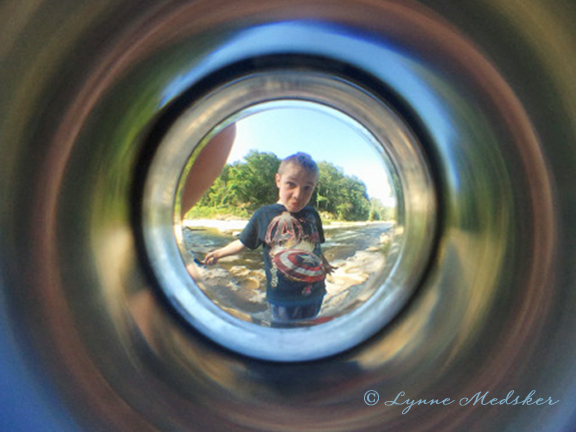 Seeing the world in circular form is interesting, trying to capture it that way? Even more so! 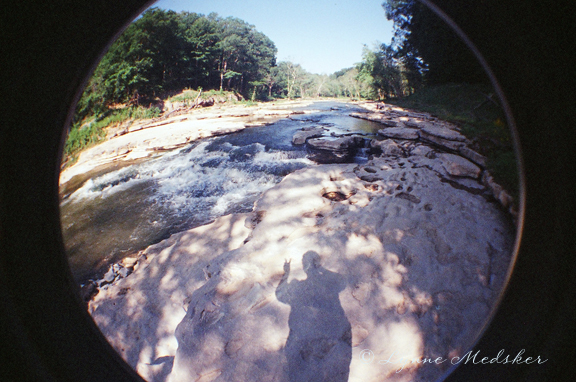 These images were all taken on a day trip to Cataract Falls here in Indiana. Since we brought our grandson he’s the subject of several of the images. That usually happens when he’s around! 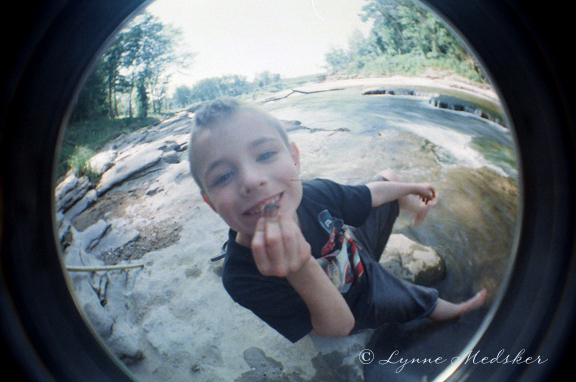 He was very interested in both the little cameras I brought with me and, at a recent event, took over the fisheye camera and burned through all the film. 🙂 I need to remember to give him the digital next time – it’s free for him to play with it! 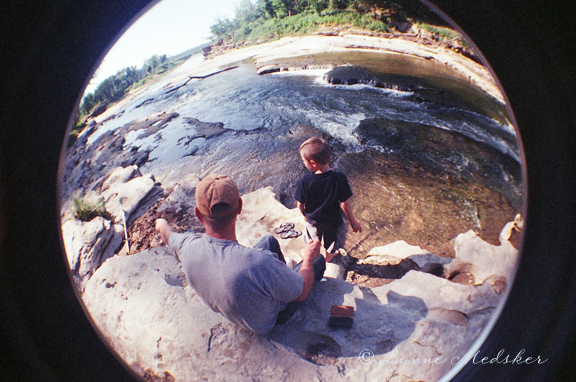 I’ll be curious to see what he captured though…I love that he’s already into taking photos at age 5! Kind of fun – although (obviously) it was hard to hold it there and not get my finger in the image! 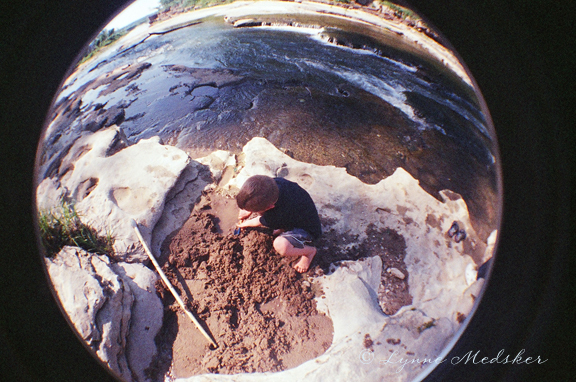 As you can tell, right now I am just haven’t fun playing…hope you are having some fun this summer too! 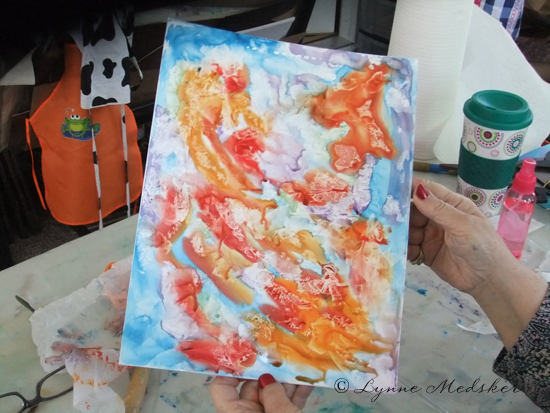 We had a great time yesterday playing with watercolors! 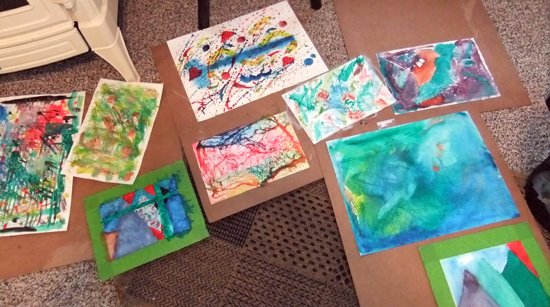 After some talk about composition and the different types of watercolor papers & surfaces we started to play. 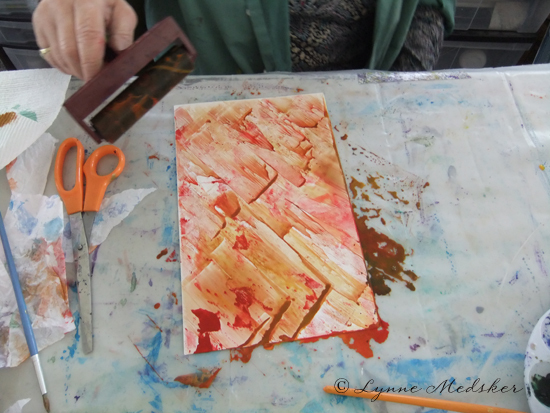 Color, texture and fun was going on everywhere! As a matter of fact we had so much fun playing there’s a class scheduled for NEXT Wednesday, January 18th from noon to 3 p.m.! We’ll be switching it up for that class and playing with acrylic paints and texturing materials. I’ve got three openings left, want to join in? Send me an email!